There’s something for everyone here and it feels like it’s evolved into a place to buy quality products and produce, not cheap merchandise. You’ll find posh chocolates, smoothies, lovely looking fruit, quality shoes, hand made cakes, fine tea, nice soaps and jewellery for instance. We were really impressed with the range and the quality of stalls in the market. For many years, traditional indoor markets in Britain have been on the decline, but you can quite clearly see that this one is bucking the trend and you can also see why. The produce and various goods on sale are good quality and all of the units made you want to look further at what they had to sell. There are around 55 retailers in the market. On top of the products mentioned above you can also get your hair cut here, buy beauty products or buy quality shoes, clothes and accessories. Many of the retailers have a real history with the market themselves. For instance Cardew’s, which sells roasted coffee and speciality teas, joined the market in 1965. Feller’s came in 1979 and Ben’s cookies just a few years later. If you’re a fan of the British TV detectives Morse and Lewis, a number of episodes have been filmed in the market. One of the most notable was a chase scene at the end of an episode of Lewis. 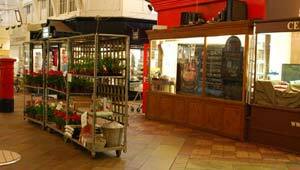 Oxford Covered Market is open from 9am, to 5.30pm, Monday to Saturday and 10am to 4pm on Sundays.